Game viewing in Chobe National Park is usually best during the dry season when the foliage is less and the animals can be seen clearly. The dry season occurs in winter from May to August and in the warm spring months from September to October. As the months progress during this period, the water resources dry up further inland and the animals concentrate near rivers, pools and watering holes within Chobe National Park..At the hottest times of the year, animals tend to seek out the shade during the heat of the day, and are at their most active during the cooler mornings and late afternoons. This is why game drives usually take place at these times of day. The best time to spot Lions is just after sunrise. Elephants can be seen at all times as they are wide awake and very active in and around the rivers in the hotter hours.Chobe National Park covers a massive area in the northern part of Botswana and features a great diversity of habitats including floodplains, swamps and woodland. This variation of natural resources attracts an abundance of animals. The Chobe River forms the northern boundary of the park and is truly one of Africa's most beautiful rivers.A Chobe safari offers some of the finest game viewing in Africa. You can explore the most accessible and popular areas in Chobe National Park or take a different route and discover some of its best kept secrets. Apart from the great herds this park is known for, you will also see a variety of predators and species specialisation in certain regions. Approach big game such as Elephant with caution - don't make any sudden or unnecessary movements or noise when in the presence of big game animals. Be prepared to drive on promptly if you sense danger or warning signs appear, for instance if an Elephant turns to face you and starts flapping its ears. Remember that all wild animals can be dangerous when irritated, startled or cornered. One of the most important things to remember when in the wild is that you should never cut off an animal's line of retreat.You can choose from a number of game viewing activities in one of the largest parks in Botswana. Chobe National Park is renowned for its huge herds of Elephant, Buffalo and Zebra, Lechwe, the rare Chobe Bushbuck and Puku antelope. Where there are Buffalo, Lions are never far away, dozing in the shade until dusk. Cheetahs are day time predators, while Leopard and Hyena hunt once the sun goes down. 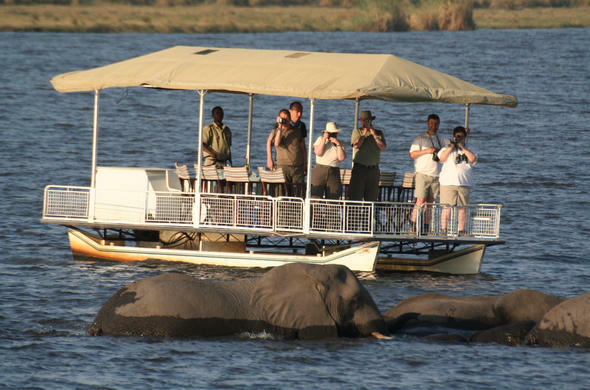 In line with many national parks in Africa, off-road and night driving is not permitted in Chobe National Park, except in private reserves and concessions on the edges. Scheduled game drives follow a twice daily pattern, departing at sunrise and then again in the late afternoon. Game is at its most dense and easily visible during the dry season and many visitors on a Chobe safari come at this time. On an afternoon game drive during this season, you could see great herds of Elephant especially in areas where there is permanent water. The Chobe Riverfront road becomes a highway for many Elephant families as they cross over to the water to drink and refresh. Along the river's edge you could see about 15 different kinds of animals at one time. Inland water sources in the Linyanti and Savute (also known as Savuti) likewise draw abundant game including Wild Dogs and aquatic Sitatunga antelope. You can enjoy a river cruise or boating safari and get quite a different perspective from the water. You can have close encounters with Hippos and Crocodiles and see a stunning array of birdlife. There are small motorboat excursions, mokoro safaris (traditional style canoe with a poler / guide) and wonderful Chobe River sunset cruises to choose from. Taking a guided bush walk on a Chobe safari is a thrilling experience. You will get a new understanding of nature and the surrounding environment, with insights and knowledge given to you by your experienced guide. Depending on where you are lodging and your location, you could enjoy a cultural excursion to a local village to get a glimpse of life in Botswana at grassroots level. If you are staying in the Savuti region you could set off on an excursion to the Gubatsa Hills, an ancient site for Bushman Rock Art.